Engaged in his dirty spate of housecleaning under the auspices of protecting the constitution and the Turkish state, President Recep Tayyip Erdoğan continues to insist on one vital scalp in his enterprise. Thus far, the cleric Fethullah Gülen has eluded Ankara from his abode in Pennsylvania. From his base, something of a global network has been constructed, one discernable through foundations and an assortment of endeavours pursued under the guise of a faith movement. These do not attest to the spirit of a pacifist warrior, averse to revolution. They suggest influence, and the markings of power. For the cleric’s enemies, there is much to be said that he has profited from the land of the free, seething about an individual he once desired to share power with. Notions of democracy are distant here; more significant is a distinct appraisal of power padded by such notions as “liberal” and “moderate”. These are the necessary marketing tools for a political figure in exile. The cleric’s movement, Hizmet, prides itself on sponsoring education and running programs heavy with the anti-radicalization agenda. His opponents, such as attorney Robert Amsterdam, retained by Ankara to investigate alleged financial misconduct in the United States, suggest that the movement’s leader “is a money-laundering criminal” (Foreign Policy, Jul 18). Politics can be a dirty thing indeed, and in the case of Hizmet, education via some hundreds of charter schools in the United States has become an enterprise of channelling and re-directing to the Gülenistas. This also has a further benefit: lobbying various levels of government within the United States, and funding trips to Turkey for no less than 200 congressmen, a clear violation of House of Representative rules. Influence, in short, is being assiduously cultivated. An individual such as Erdoğan is bound to be suspicious of mass education endeavours that favour a particular slant for the obvious reason that he has one himself. Hardly in the mould of a free-thinker, he is bound to see rival ideas as guns and bullets. The failure of the coup has given the president a strong hand to press Washington on Gülen, who has come out of traditional obscurity to suggest how rich it was to be accused of leading a coup from abroad, “As someone who suffered under multiple military coups during the last five decades”. Sadly, those who suffer instability are not necessarily going to prevent it from recurring. The attempt to drum up the case to the Obama administration is another feature of Turkey’s recent foreign policy: play the card of the stabilising power, be it in terms of quelling flows of refugees into the European Union, or stemming the forces of fundamentalism. This, despite a distinct ambivalence, if not actual tactical corporation at points with Islamic state officials. Fundamentalism does come in different shades. As for what Ankara is seeking to adduce to prove the link to Gülen, the bar of evidence can be rather low. To justify the value of a fight, the enemy must always be inflated, credited with more influence and power than he necessarily has. Nothing is worse in revolutions and wars than the notion that one’s opponent was mediocre and incapable. The look in that mirror can prove most unenviable. This strategy of inflation entails a ballooning approach on the part of the victor, one that has seen 20,000 government employees detained across various fields of employment. These include 185 admirals and colonels, and 1,500 finance ministry officials. Not even the prime minister’s office has been spared: 257 personnel have been let go. The smell of treason is wafting. 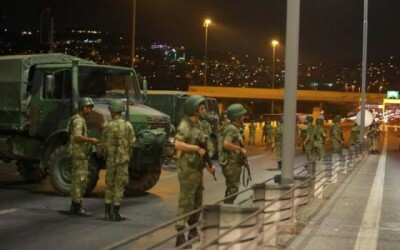 The coup plotters may certainly have drawn inspiration from Gülen in some form, alongside those traditional Kemalists who treat the Turkish constitution as the ultimate State fetish. The cleric’s Hizmet movement in Turkey is not to be taken lightly, and has been accused of winning supporters in the country’s judicial and military circles. This has spilled over into a personalised flexing of muscle. In 2013, Erdoğan took note of the efforts on the part of judicial officers in their efforts to bring corruption charges against officials within his inner circle, including son Bilal. By way of retaliation, Hizmet was confronted, its followers ostensibly removed from schools, and the officer corps and the police forces purged. What we do have to go on in place of solid evidence on external plotting is a diet of overcooked rhetoric. Turkish Prime Minister Binali Yildirim has gone to the press to say that Washington has been supplied with details of the cleric’s “involvement” further adding on Saturday that any country standing by the exile “is no friend of Turkey [and] is engaged in a serious war with Turkey.” On Tuesday, the White House spokesman Josh Earnest revealed that Ankara had supplied the State Department with relevant material. Much of Ankara’s policy towards its allies is ceremonial rather than substantive, but the point being made is important enough. Washington does not want a querulous NATO ally, one whose relationship will jeopardise the use of, for instance, bases in operations against Islamic State forces and the like. On the other side of the ledger, assumptions that Gülen is encased in some moral white knight armour would also be misplaced. Political systems are mothers of necessity, breeding allies who may well in time become outcasts. Today’s outcasts can, in turn, become tomorrow’s autocrats. History’s examples of moderate exiles, harboured in more tolerant waters, are few and far between. Had the coup succeeded, irrespective of whether Gülen’s hand was heavy or otherwise, the cauldron of Turkish politics may well have done something else. We may never know, though the hand of tyranny is rarely out of a job.